Since 2000, Welcom Cabinets has served the Lowcountry and surrounding areas as an exclusive dealer for Wellborn Cabinet. At Welcom Cabinets, we take pride in our ability and dedication to giving you the kitchen, bath, or closet of your dreams while accommodating any budget. Unlike most cabinet suppliers that offer multiple cabinet product lines, Welcom Cabinets has always offered only one - Wellborn cabinets. This loyalty has reaped many benefits that we carry forward to our clients: Extremely competitive pricing on a top quality product, unbeatable turnaround times on cabinet orders at only 2 Â½ weeks, solid warranties, and dependable service and product availability - just to name a few. When you partner with Welcom Cabinets on your project, you can rest assured that the end result will be exactly what you expect, with no surprises. 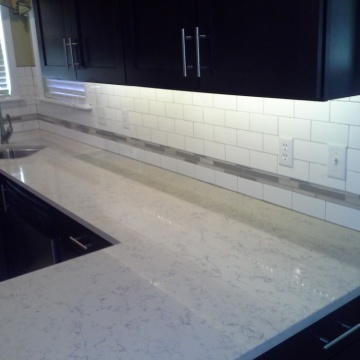 We are confident enough to make this claim because we handle every aspect of your project from design to installation. Our showroom, with its array of door samples, functional displays, and state-of-the-art technology allows you to see and experience first-hand what your new kitchen, bath, or closet will look like. 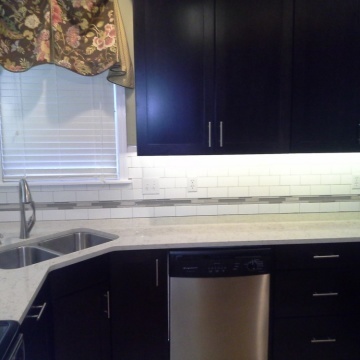 Throughout the years, Welcom Cabinets has become reputable among thousands of local homeowners for our personalized design service, professional installation, and outstanding service after the sale. Our ultimate goal for every project - no matter how big or small - is to make a happy, satisfied customer. Overall I was deeply pleased with all the work they did. I have no bad things to say about them. I would recommend them to anybody. If I had another house I would get them again to do my cabinets. The installation of the cabinets looks beautiful. Everything was done professionally. They didn't fall short, they did stuff I didn't know you could do with the baseboards. I'm deeply pleased with them. By understanding what we wanted and engineering it on the spot with the parts that came in from Alabama they were satisfying. They had to do all kinds of adjusting and they did a fabulous job. Thanks for being professional, particular, prompt and having great prices with high quality. My cabinets are so impressive. I give your company a 5 star rating. I was extremely impressed with all aspect of the business. I was also impressed with the professionalism of all parties involved. I have been spreading the word and showing off my cabinets to all my friends, thanks to the camera on my iPhone. We plan to have you guys come out again to give us a quote on another project. We are not quite ready financially, but would like to have some plans drawn up with a price, and we will gladly pay the $200 or $250 that you require, so when we are ready we know exactly what we are looking at. Of course, we do understand that prices can change if we wait too long after getting a quote. Thanks so much. You guys have a great business. I looked online and research reviews, how long the business had been around, etc. As crazy as this is, your website was very attractive and professional so I felt that said something about your company and I made part of my judgment call on that. Once I got into your showroom, I could tell that the company was extremely professional and particular, not to mention, the fact that I got a very prompt call back from Bill Brown, which was also very impressive. I was most satisfied with the crew; They were timely, attentive & provided thorough explanations. John, the owner showed up on most days to inspected the work to make certain it was per his standards. I thought this was extremely professional. The owner cares about his company and is extremely easy to communicate with. In addition, the owner makes certain that the work meets his standards. 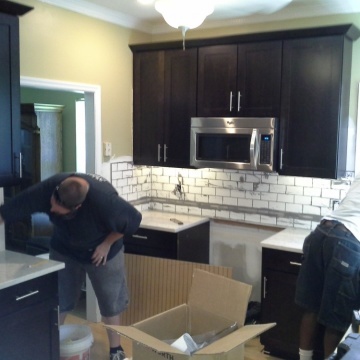 We were very happy with the entire experience from beginning to end; from the planning of the job with Yves and John, to the demo; prep work, and installation of the floor, cabinets, and countertops. Jimmy and William were awesome and did a great job! Bill was very helpful and understood our budget concerns. They always kept me in the loop and never showed up without calling first. Always left the job site neat and tidy. Communication was fantastic. If we had a question or concern someone was always willing to provide information. The final product is fantastic. Love my new kitchen. Great experience. Everyone including the installers were very professional. Cabinets are made in USA which was important to us. They also have a good selection of cabinets to choose from. The whole experience was great. Good people to work with. 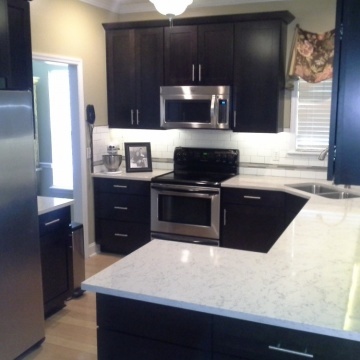 When my wife and I made the decision to renovate our kitchen there were 3 factors that we considered important to us besides functionality, appeal and cost. Those 3 additional factors were; customer service, the quality of the products that would be used and we be exceptionally pleased with our new kitchen once the project was complete. John Silvia, Bill Brown and their team not only met our expectations they exceeded them in all areas. After my wife selected the style and color of the cabinets she wanted they utilized a computer design program and offered suggestions based on their professional and personal experience that maximized the kitchen cabinet space. My wife and I couldn’t be happier with the quality and attention to detail Welcom put into our kitchen make over. Each member of the Welcom team provided first class customer service before, during and after our kitchen renovation project and I would highly recommend them to anyone considering any type of kitchen work. It was a true pleasure to work with Welcom. I appreciate that John and Bill seeked feedback during and after the project and that John came back out 2 weeks after the complition just to follow up and to be sure we were completly satisfied with the quality of their work and the overall experience. Great job!! Done on time everyone was nice and professional . I was most satisfied with the finished product. Once everything was installed, I was very happy with the look, and how the job was put together. They did a good job of communicating where they were in the process of the installation. They were very professional. Everything was very organized and well scheduled. They were really on top of things. I liked the timing of the cabinet top removal. The procedure went well and they kept everything usable. They put the granite on without keeping the cabinet unusable for too many days. The gentleman who worked with us was always able to give us a timeframe. They did an excellent job and were very professional. They were really on top of things. It was very nicely done. Our experience could not have been better. Everyone were very professional and extremely nice...even the installation crew. Bill listened to what we wanted and then offer suggestions but did not try to talk us into something other than what we wanted. 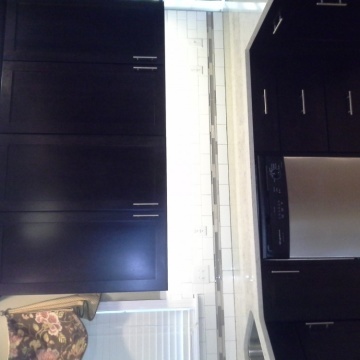 Welcom cabinets was completely professional, and the installation went very smoothly. The timeline was actually half of what they estimated, and they were very responsive to questions. Overall I'm very pleased with their service. My experience was wonderful, and I've been bragging about them to everyone. I was most satisfied with the planning ahead of time. I needed the most guidance with that, and they were wonderful. I needed somebody for ideas, and they were exactly what I needed. Showed up on time.Stayed until the job was done in one day. Product was what I ordered. Took all the trash when they left. Job site was clean. Did a very good job. 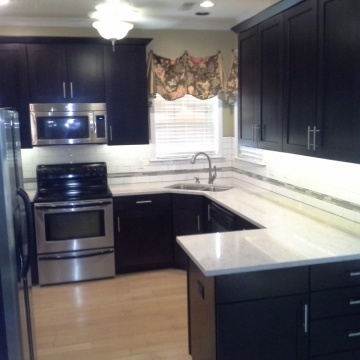 From our very first visit to Welcom Cabinets, our experience has been Excellent. The finish product (Kitchen) is beautiful and meets all my expectations. Every person involved in the process were professional, easy to talk to, helpful, and confident in their product. I have praised Welcom to many friends. Everyone LOVES our new kitchen. 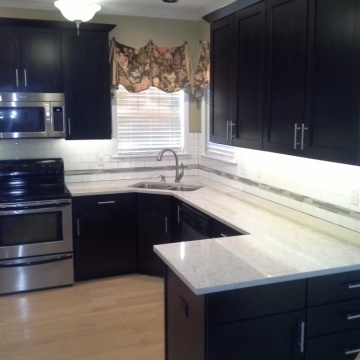 I was most satisfied with the quality of the cabinets and the crew's efficiency and knowledge of installation. I was most satisfied with the detail to a finished appearance. 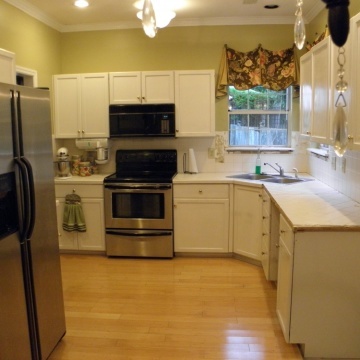 Areas were cabinets didn't get pushed to the wall because of the existing wall they recommended trim and installed it. In other areas they made suggestions for modification that would enhance the look of the finished product. They did a very good job. 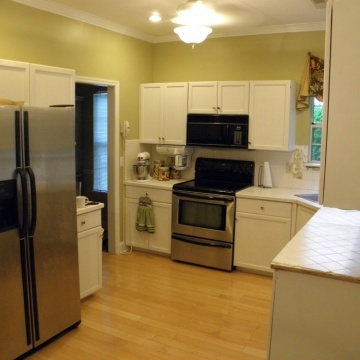 I know it is difficult to come into an existing kitchen and we have hardwood floors and they protected them very well. We had no damages to our wall paper, floors, and ceilings. The companies were able to work in such a manner where there were no incidents. They were just wonderful. I was satisfied with everything. 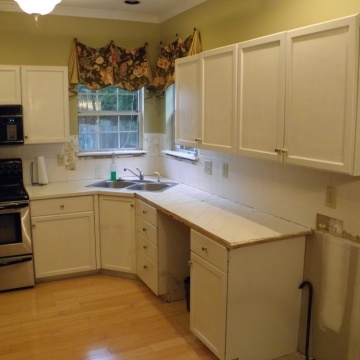 Welcom cabinets was wonderful; when the crew was here they covered up flooring and gave us access to our microwave & frig. Our kitchen was a small project and they got it done in 1 week! Great job! What a wonderful experience we had in the make-over of our small kitchen. Work was done quickly,the product is fantastic quality made in America, the workers were professional, clean and helpful. We had a hassel free experience with very trustworthy craftmanship, provided by your crew. Money well spent with no problem that you dould not solve, THANK YOU Welcom. Ray W.
the cosideration to details that I needed to fit certain kitchen appliances; shelving was adjusted to serve my height needs; care was given with regards to electrical malfunctions found on the demolition of oven wiring.....we are safer now with new 220 installed correctly; helpfuness and kindness of the crew....THANK YOU for a wonderful kitchen, we are extremely pleased ! 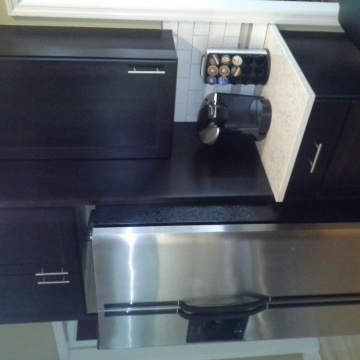 welcom cabinets was very professional but personal when my husband and i ordered our cabinets. 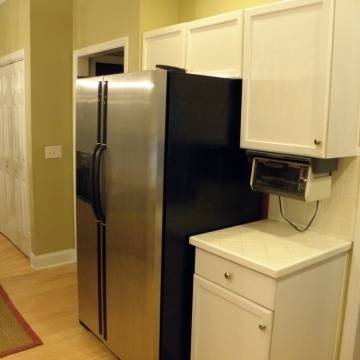 they stored our cabinets for a while until we were ready at no extra cost. there was a problem with the color of the moulding where it had to be put together and welcom immediately reorder another piece at no extra charge. we both highly recommend this company to anyone who is looking for beautiful cabinets. - The delivery date of the cabinets was short and on time.- Yves was always available to talk to, wether by phone, e-mail or meeting at his office even on Saturdays. - The kitchen design was very well conceived making it an extremely enjoyable space to work in.- The high quality of the cabinetry.